Leo Schrall, the highly successful Bradley baseball coach who led the Braves to two appearances in the College World Series, enjoyed one of the most varied baseball careers in Peoria's history. A Notre Dame athlete, he played minor league baseball, and after his playing days were over he became a manager. 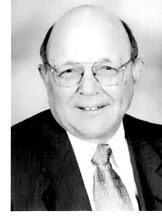 He ran the Hiram Walker entry in the Sunday Morning League for a number of years and also was manager of the Peoria Redwings in the All American Girls Baseball League. But it was at Bradley that he achieved national fame. His teams won 346 games while losing only 189 in 24 seasons, and after his retirement, he was named to the Hall of Fame of the National Collegiate Baseball Coaches Association. 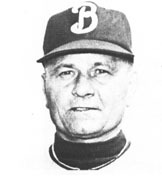 Schrall first took Bradley to the College World Series at Omaha in 1950. The Braves lost their first two games that year to be eliminated, but he took them back in 1956 for a fourth place finish. Bradley joined the Missouri Valley Conference in Schrall's first season. Under his direction, the Braves won four Valley titles outright and shared a fifth.